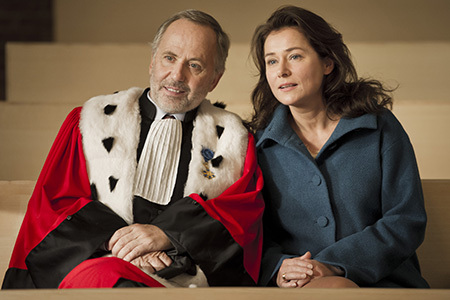 Danish actress Sidse Babett Knudsen, perhaps best known for the TV drama series Borgen, but seen recently in Peter Strickland’s excellent The Duke of Burgundy, is positively radiant as the single mother and anaesthesiologist who has an unlikely admirer in the highly strung Racine. Together with young Eva Lallier, who plays her precocious 17-year-old daughter, these effortlessly glamorous women threaten to hijack the entire project, were Luchini’s curmudgeon not so frustratingly endearing. We glimpse class conflicts, racial and religious tensions, professional incompetence and of course, at the film’s centre, the hideous death of a child. But thanks to a string of naturalistic, relatable and utterly endearing performances, coupled with a script that acknowledges that our petty rituals and desires too often distract us from life’s greater problems, Courted emerges as a curiously entertaining film about people, rather than judicial procedure.